Every webmasters and bloggers know the Google Adsense is the better way to earn huge money from online. Webmasters and bloggers earn good income by placing adsense ads on their site. Every adsense ads shows +1 button and annotations for visitors to your pages are more likely to see ads that their social connections have +1’d. As a publisher you have the full rights to disable +1 button on your adsense ads. 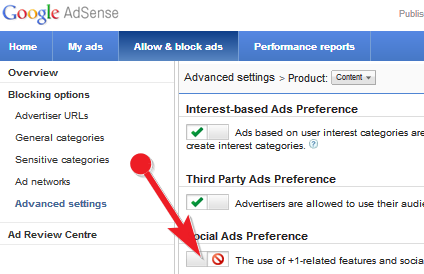 Here the simple method to how to disable +1 button on your Adsense ads. 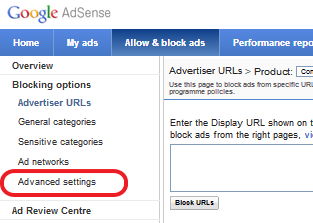 Click on "Allow & Block ads"
Wait some minutes for the action, finally the +1 button will be removed from your adsense ad banners. Then select Mobile content and do this same method to disable +1 button on your mobile ads.